Whenever I buy cherries I have a very difficult time taking home just what I need for the next day or two; that is to say I always arrive back to my kitchen with at least a kilo and a half of these burnished ruby stone fruits. Ian doesn’t eat them like I do, still damp and chilled from the fridge out of a huge glass bowl (with a smaller bowl for the pits, of course) so I find ways to incorporate them into recipes. In addition to salsa I love them pitted and laid out flat to freeze on a baking tray, in smoothies and mixed in with maple granola and plain Greek yogurt. Once I made this salsa for the first time I couldn’t believe that I had overlooked this now obvious salsa component, the tart-sweet cherries marry perfectly with the slow burning heat of the jalapeño peppers. When pitting the cherries it is helpful to first crush them under the side of your knife as you would to a garlic clove, this allows to pit to be picked out quite easily. 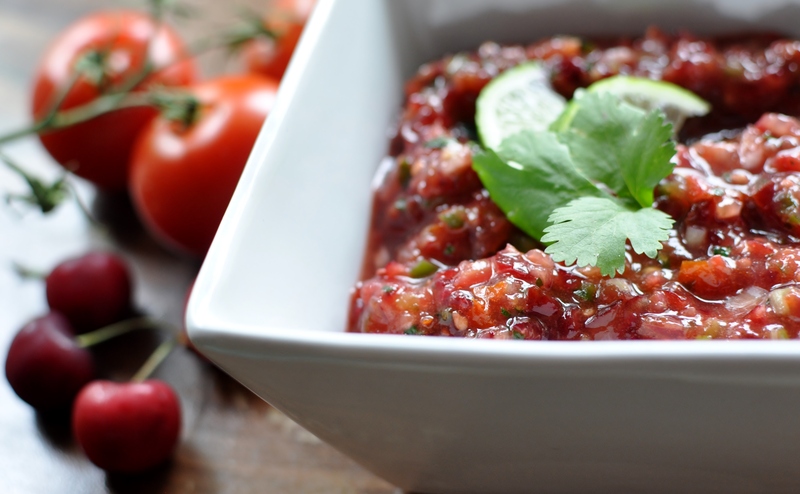 The beautiful dense redness of this brightly flavoured cherry salsa is a natural pair to tortilla chips, fish tacos, flank steak, baked tofu dusted with chili powder and a diced avocado salad with big bunches of cilantro. Place all of the ingredients in a food processor and pulse 4 or 5 times until the salsa becomes a deep cherry red flecked with green cilantro and jalapeño peppers. This song by The Avalanches is suitably bright and positive, making it easier to ignore the relentless May rain and to let optimism prevail over your Monday afternoon.